Suddenly Jio preview offer is migrated to Welcome Offer. This is a limited offer only 4GB per day allotted for 4G speed after 4GB, user will be access unlimited internet by 1Mbps speed. 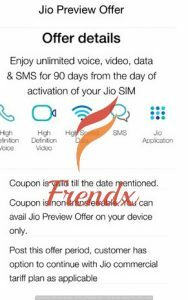 Reliance Jio and Reliance CDMA (rcom) is going to same way as they are from couple of month. No commitment will be continue with customer so we have to take action against this migration, Take a complain ageist there migration and write something about our opinion to any blog or site. “Finally a genuine report on jio’s atrocity. Jio beyond doubt has clearly cheated LYF-JIO preview customers. Customer care defend it by saying even at 16kBps its still unlimited. What a stupid thing to inform customers as though the customer have no idea about data transfer rates. Customer care of jio is worse, they dont answer calls for atleast 45 mins. I can only imagine the number of complaints they are receiving. One Customer care executive even told me that they are receiving many complaints on the matter. Jio is poorly prepare. Handles customers poorly. They are like bots programme to repeat Ambaní’s announcement that all preview users will migrate to welcome offer. I am no longer excite about Jio. They did this to be minority LYF customers, so its definitely not about QoS. They just couldnt care less. I am sure they would introduce many limitations to unlimited calls, unlimited night internet. They will put a star and say UNLIMITED CALLS TO JIO NETWORK, others you have to pay. UNLIMITED NIGHT DATA but FUP of 1kBps applies. I have just taken a sim, four days back and it says recharge as your limit expired. It is 20th Nov. only. Dont worry, This is not serious issue after activation it will be automatically upgraded to 4 Gb Unlimited per day data offer and unlimited caLL.